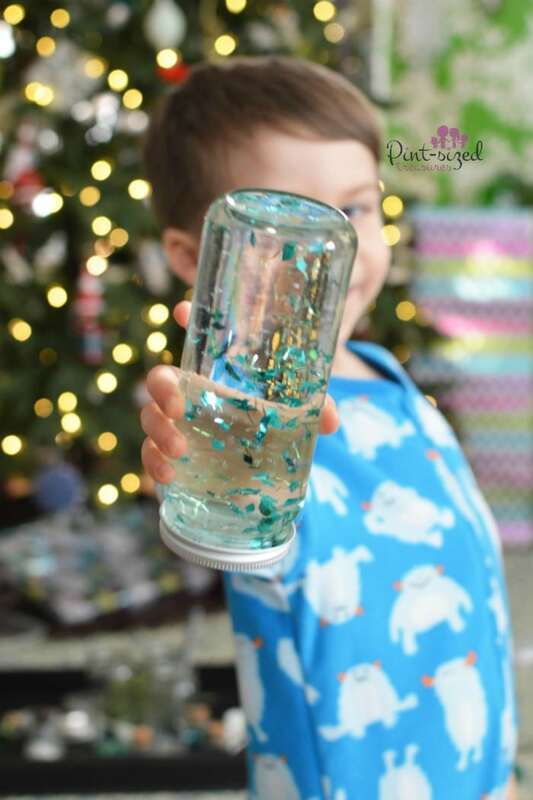 Home › Creative Creations › Crafts › How to Make A Christmas Snow Globe That Doesn’t Leak! 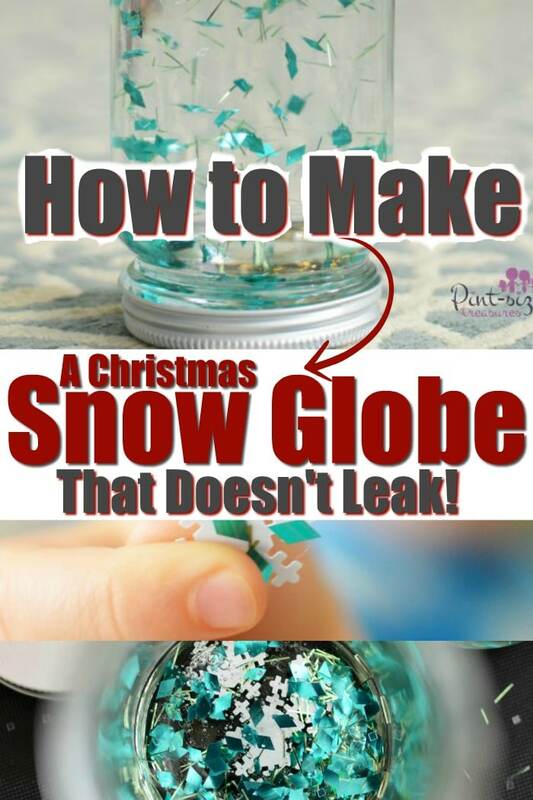 How Can You Make A Christmas Snow Globe That Doesn’t Leak?! I’m sharing my secret to this today! Think of it as my Christmas gift to your family! <3 If your family loves celebrating snow, this DIY Snowman Twister Game is a fun addition too! Why are snow globes so incredibly special to me? Is one of my most favorite parts of Christmas. And what’s even more magical is when kids get to create their very Christmas snow globe. Every single Christmas my mom would climb the rickety ladder that lead to our family’s dusty attic. Inside that attic were boxes and boxes of Christmas decorations. I couldn’t wait until she carried down the cardboard box that held her collection of snow globes. We’d carefully unpack them, dust them off and place them around our living room coffee table. The display of snow globes wasn’t super fancy, but it was something that would keep me entertained for hours. 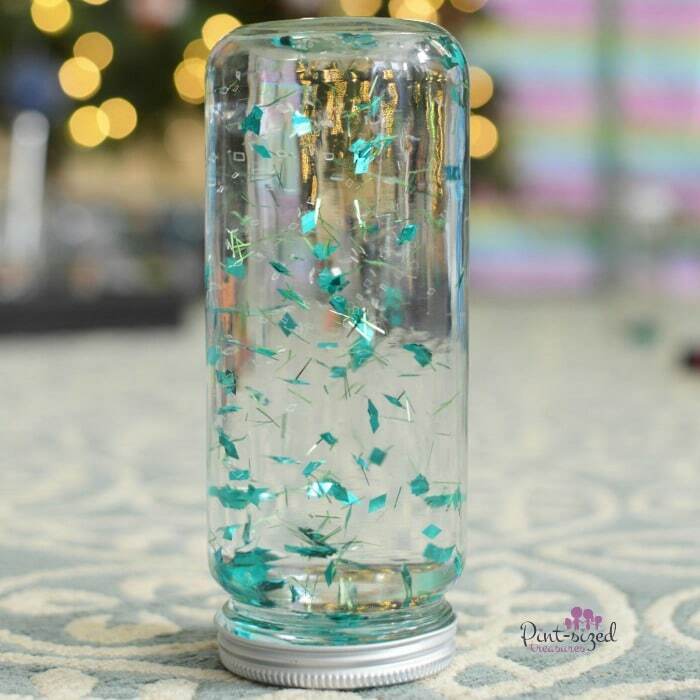 If you want a gorgeous snow globe centerpiece for a table in your home, this is the DIY project for you! 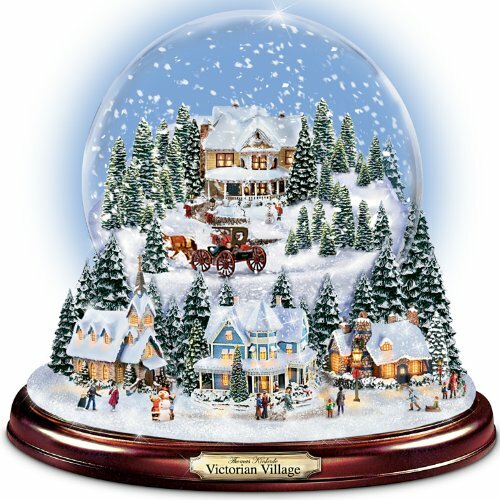 Picking up snow globe after snow globe, I could imagine myself inside that snowy world of smiles and holiday music. Winding up every single one and listening to their music box sounds was an added treat to the little specks of snow that floated all around the figurines inside. 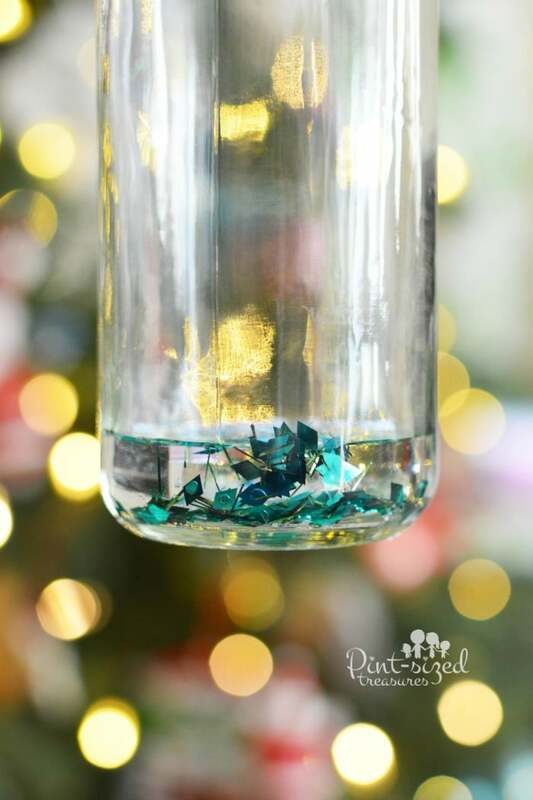 How Do You Make a DIY Snow Globe? And that’s something I want to pass onto my children. All wrapped up into one beautiful, but simple snow globe. I want to help my kids (and yours!) 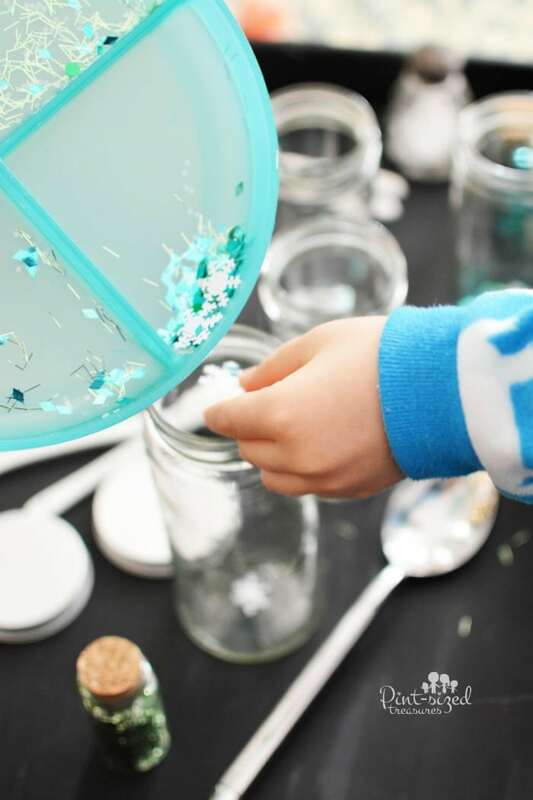 create a snow globe that actually lasts year after year. No one likes snow globes that have ugly, murky water in them. We often toss and replace those. And one wants a snow globe that leaks! With our solution, the holiday colors stay vibrant and bright for years of Christmas snow globe memories. 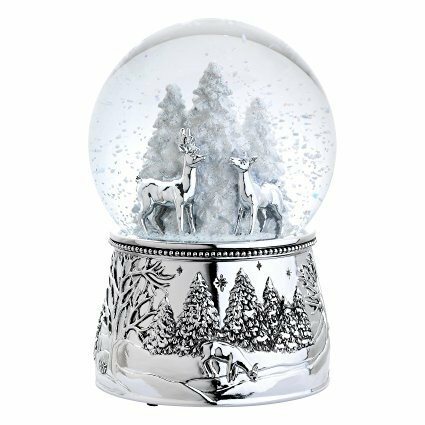 Since your child will LOVE this snow globe, I want to give you some awesome “in the know” tips to make this the best snow globe ever! Don’t be shy with the glycerine! 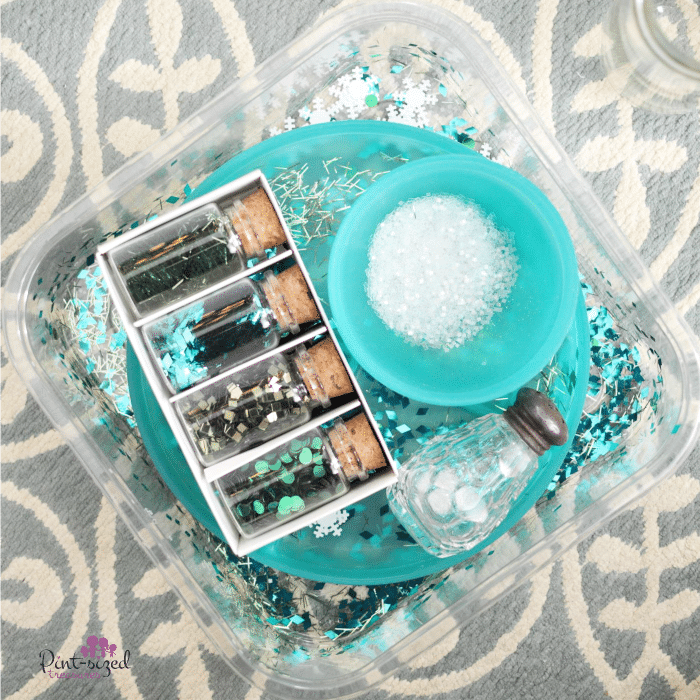 The more glycerin you use, the slower the glitter will float and sink down. 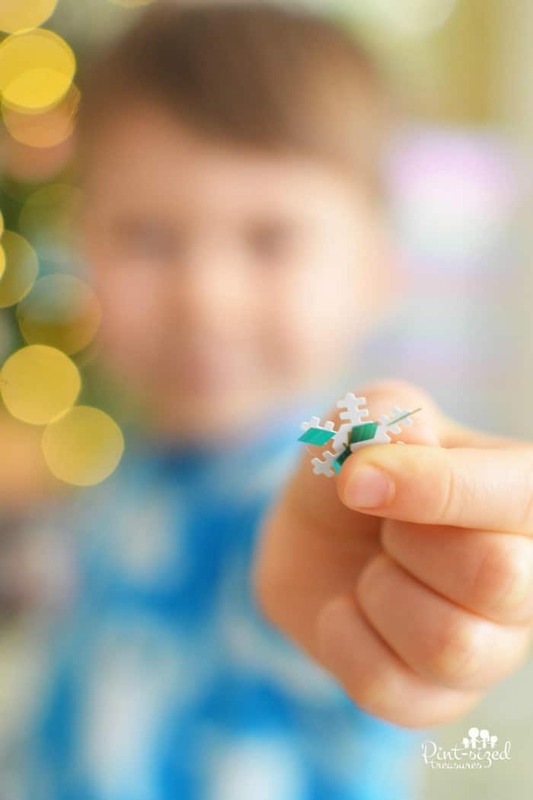 Who doesn’t love to watch those snowflakes and glitter ever-so-slowly touch the ground? Shake things up! 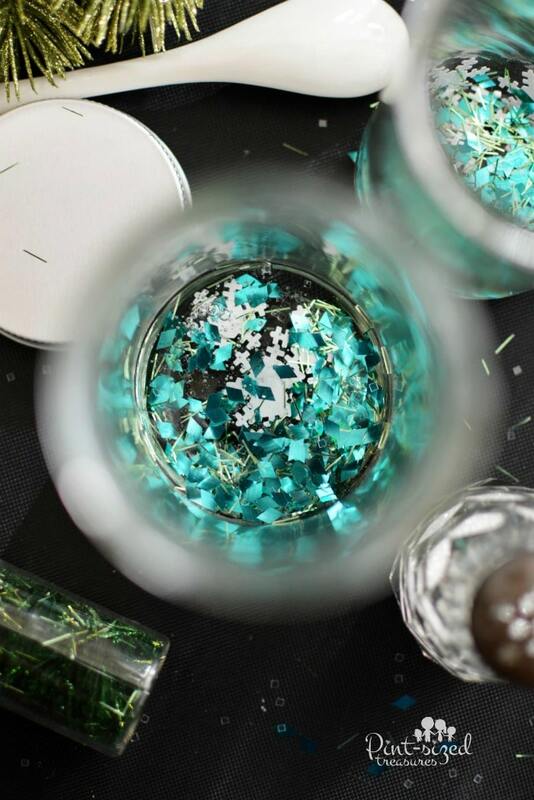 If the jar sits for a long time the glitter may start to seem like it’s all sticking together in chunks. Simple solution? 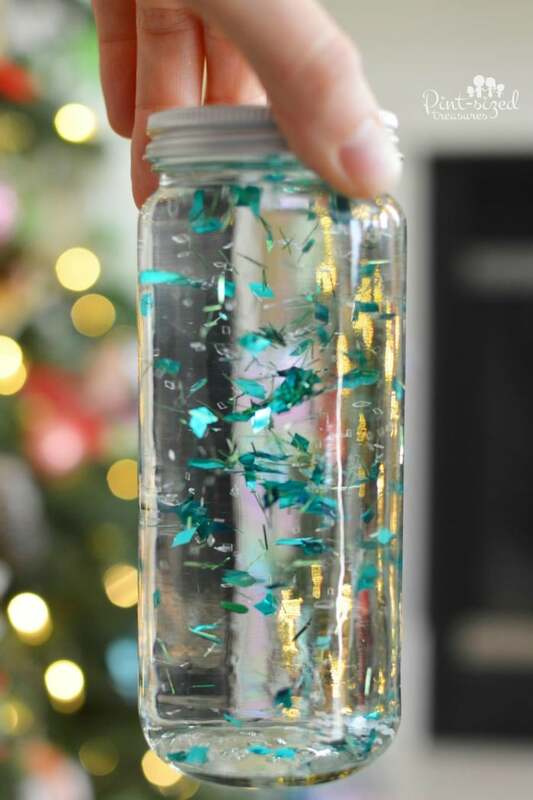 Give your snow globe a few good solid shakes until they loosen up and float freely. These snow globes are great for calm down jars too! Psst! Here’s my favorite version of calm down jars from Lemon Lime Adventures. It’s a Lego one! 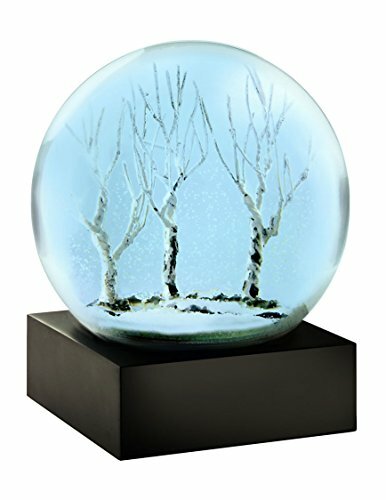 Snow globes can even be used as simple timers! For instance, you can tell kids to complete the following tasks before all the glitter or snow falls to the ground! 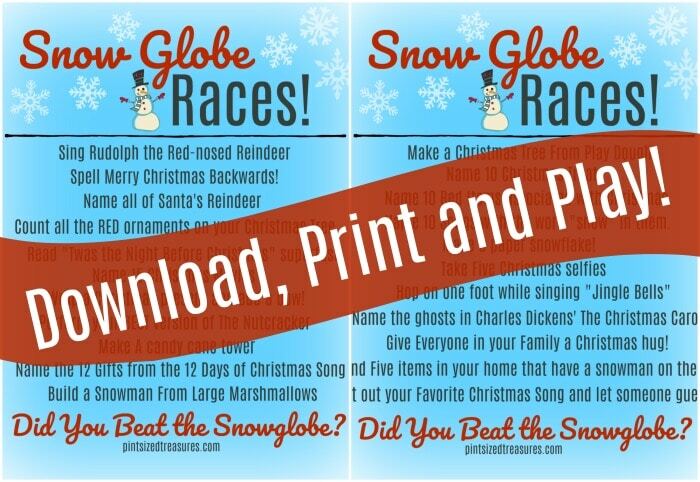 Or you could play these Snow Globe Races as a family! 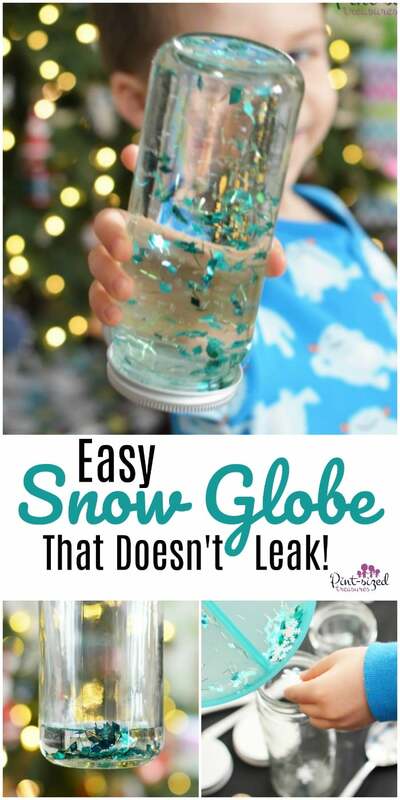 They’re sure to get the giggles and best use out of your DIY snow globe! Just download, print and play! 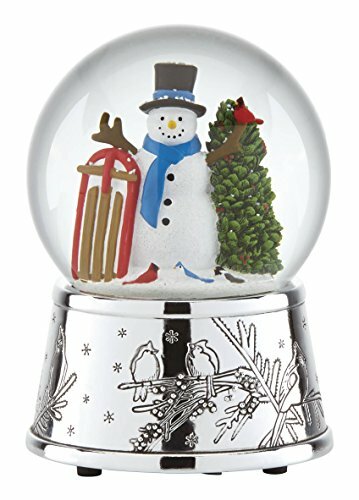 After all that snow globe talk, let’s get down to true snow globe business — creating your very own! Start by thoroughly washing the jars and lids. Carefully dry the lids and set aside. 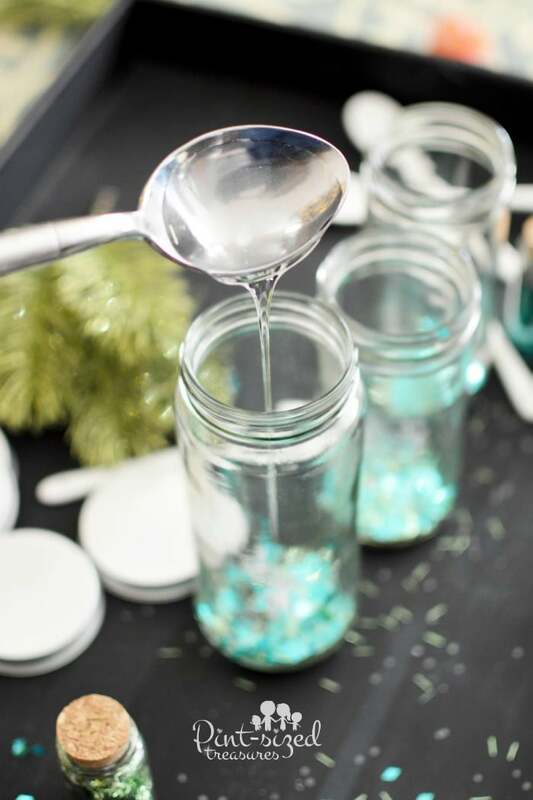 Place a spoonful of fun glitter in different shapes, colors and sizes to the jar. Add in about 2 tablespoons of vegetable glycerin. Pour half of the distilled water in and stir a few times to help dilute the glycerin. Add more distilled water until the jar is as full as you can possibly make it without overflowing (the goal here would be no noticeable air bubbles when you shake and move the jar around). If you have concerns about little ones trying to open them or lids possibly leaking you could use waterproof glue for this.